Industrial designer Konstantin Grcic has done it all, from spoons to umbrellas to lights, but he’s best known for his data-driven chairs. We dropped in on his Munich studio to sit awhile in his seats. 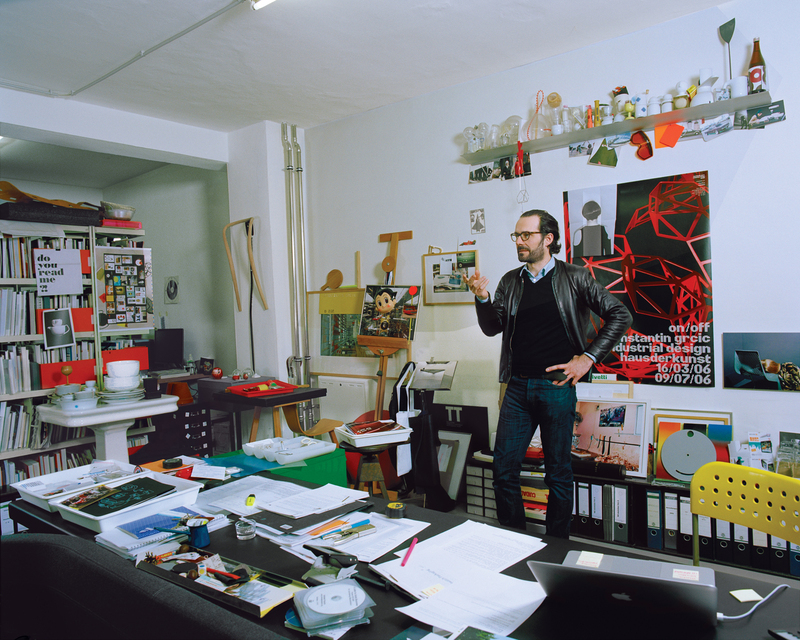 Industrial designer Konstantin Grcic in his Munich studio. Photo by Oliver Mark. 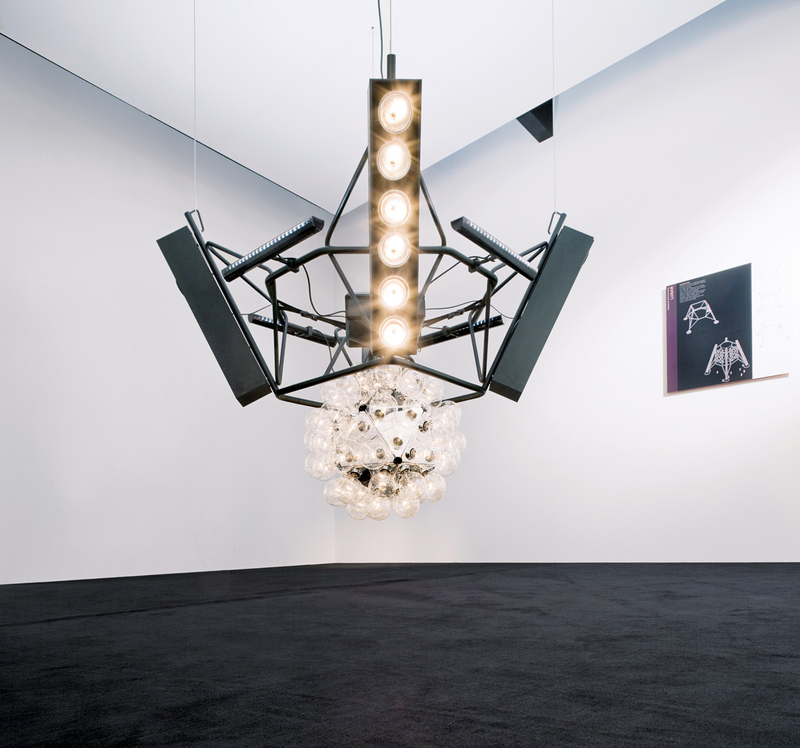 Konstantin Grcic’s work is approaching its 20th year in production. His first releases, in 1991, were the Tom Tom and Tam Tam side tables for SCP Ltd. They were re-released in 2009 with sliding mechanisms on their support columns. The result? Adjustable height built in. Landen public seating for Vitra Edition, 2007. The “terrace”, in his unassuming former factory space not far from the main train station in Munich, is a place where he and his cohorts can step outside for a breath of fresh air. A handful of classics as well as his own chairs—–like the Myto (foreground) and the Chair One (on the table at right)—–upstage the suddenly bashful designer. 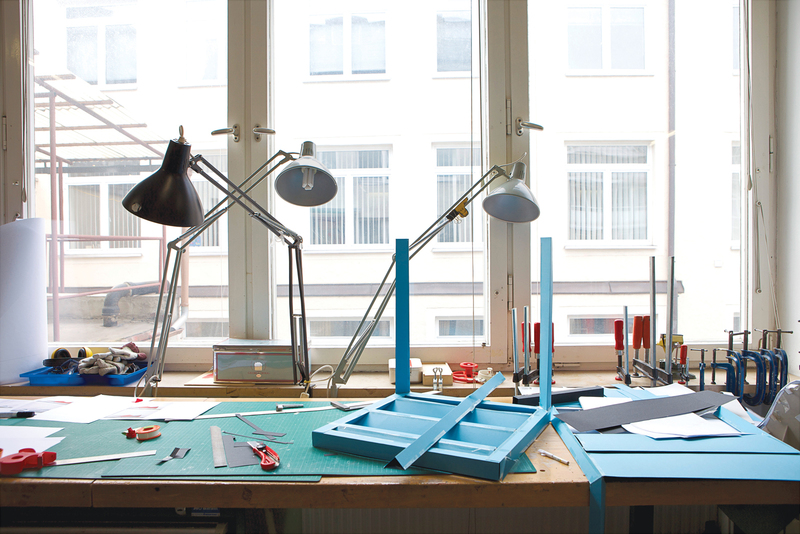 An advanced mock-up for the stackable outdoor chair he's designing for Piazza San Marco in Venice sits on a workstation. Lunar was a light project for Flos in 2008. 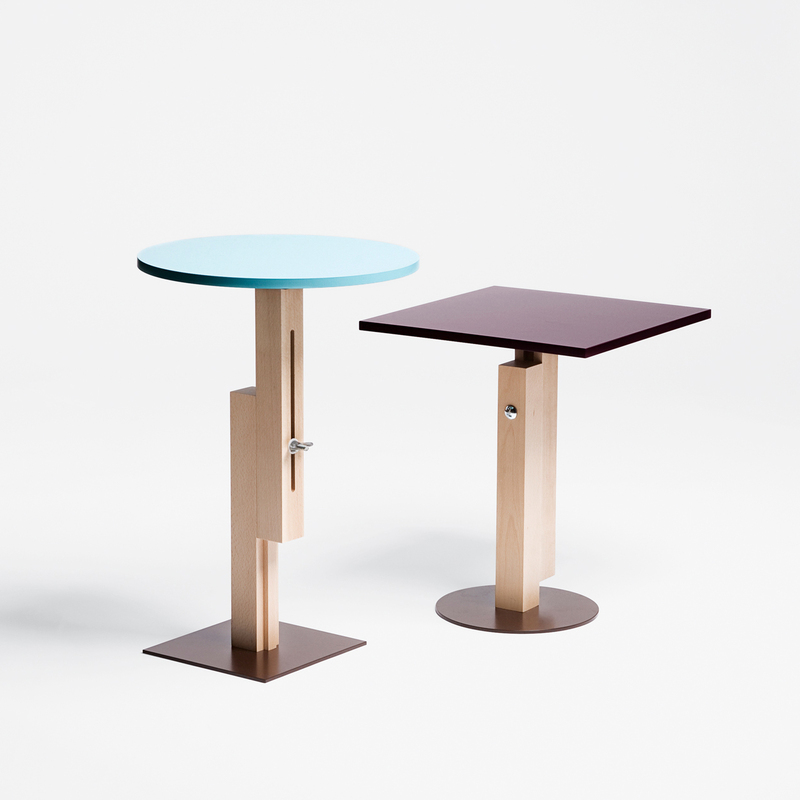 MIura barstool, designed for Plank in 2005. Grcic collects various objects—–including an old-fashioned trash can his sister salvaged for him—–in his studio, which he catalogs for inspiration. Grcic’s Mayday lamp for Flos was inspired by the lights used by automobile mechanics. The ES shelf for Moormann is delightfully canted. The Chaos family of seating for ClassiCon encourages sitters to perch, squirm, and fidget. Odin couch for ClassiCon, 2005. Relations stacking glasses for Iittala, 1999. Osorom seating for Moroso, 2002. The Myto Chair, 2008, for Plank. A poster on one of the doors of his studio reads “No to war!”. Grcic is a very hands-on designer, whose work includes tableware. 2 Hands laundry basket for Authentics, 1996. ES Shelf for Moormann, 1999. Passami Il Sale utensils for Serafino Zani, 2007. The 360 degree Chair and Stool for Magis, 2009. The Diana side table for ClassiCon, 2002. Chaos family of seating for ClassiCon, 2001. Accento cutlery for Serafino Zani, 2009. Chair One for Magis, 2004. 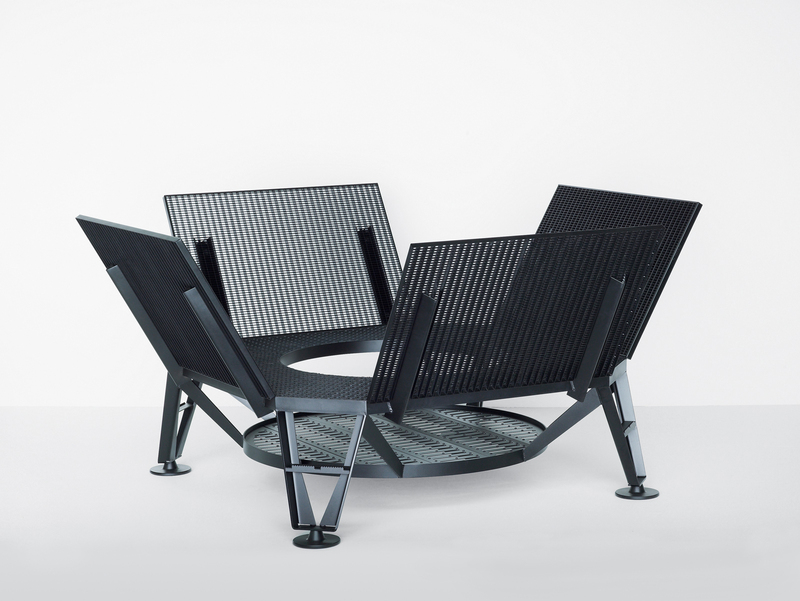 Crash lounge chair for Established&Sons, 2010. If there were a German version of the French concept of jolie laide—–maybe the Teutons would choose something closer to “ugly cool”—–Grcic’s work would be it. His creations are a little weird, full of hard edges, and not necessarily approachable. At the same time, they’re stylish and functional; they know what they’re up to, even if you haven’t figured it out yet. Thanks to Grcic’s near-obsessive engineering-oriented design process, in which he deconstructs an everyday object then reconstructs it so that it is optimally suited to its own, very specific purpose, as often as not it’s true: This is a chair (or salad tong or desk) that knows more about what you want than you do. “He is very mindful of how we interact with and use objects,” says Zoë Ryan, who curated the Grcic exhibit, the first solo design show at the Art Institute of Chicago’s new modern wing last year. A Munich native, Grcic grew up in Wuppertal, an industrial center in western Germany. After high school, he tried to find a woodworking apprenticeship in Germany. Unsuccessful—–perhaps because his schoolwork tracked him for higher education—–he left for England, where he trained as a cabinetmaker before getting a degree in industrial design in 1990 from London’s Royal College of Art. For a recent project designing school chairs, he and his team of five read official reports about what children’s bodies need, conducted interviews with teachers and students, and learned about how financing impacted the school furniture industry. Once seated on the 360° chair—–designed in 2009 for Magis and so named because it swivels in a complete circle, the degrees of which are marked on the chair’s base—–it’s easy to imagine its uses. It would be great for pulling over to somebody’s desk, swiveling to chat with a colleague, then rolling over to the next desk. You may not want to sit here for hours, but something about it feels right. High-end manufacturers like Magis, Flos, ClassiCon, and Plank commission most of Grcic’s work, which gives him the freedom to ask this kind of question. “Because we work for small companies, I can design more radical things—–we don’t have to please a broad market.” Nonetheless, he hopes that some of his ideas might be picked up by a wider audience.